Whatever channel I was watching when I turn off my TV and cable box is the one that will be brought up the next time I turn them on. This might not be the most useful feature, but it is one about which I would never complain. Recently, it led to some fun experiences. I was watching something on the History Channel the other night. When I turned on the TV the next day, I was just in time for the Ancient Aliens marathon they seem to air...well...pretty much every day. I kept it on in the background for a while because I was doing something that did not require much concentration. 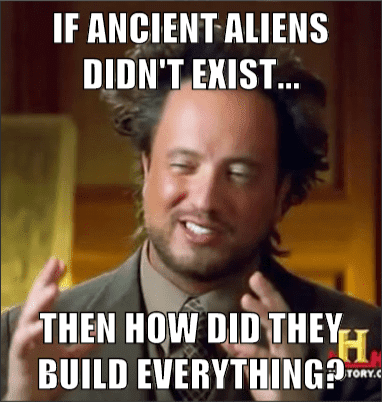 I have written about Ancient Aliens before, and after seeing more of it, I now think it just might be one of the stupidest things one can find on TV these days. Yes, I realize that is really saying something. The contest for the stupidest thing on TV is a competitive one. At the same time, I would not say that Ancient Aliens is entirely without merit. I think it can and should be used to illustrate the problems associated with religious thinking. It continues to baffle me how any atheist could be taken in by this nonsense, but I know that some are. There are all sorts of things science cannot explain. Science may eventually explain some of them; however, there are likely to be things that science will not explain, at least not during our lifetimes. Most atheists I have encountered are quick to note that the inability of science to explain something does not mean "goddidit." They have no difficulty recognizing the absurdity of such claims. Most are familiar with the "god of the gaps" trap into which many religious believers fall. Some atheists seem to have real difficulty recognizing that this is exactly the same claim that forms the basis of Ancient Aliens and other "unexplained mysteries." If "goddidit" does not follow from the fact that we do not have a scientific explanation for a particular phenomenon, "ancientaliensdidit" fares no better. And while we're at it, let's throw ghosts and Bigfoot in here too. "But couldn't ancient aliens have been responsible for some of the things we can't explain?" If you are willing to go down that road, then why not ask the same of gods? Couldn't gods have been responsible for them too? Our inability to explain something does not become evidence for gods. 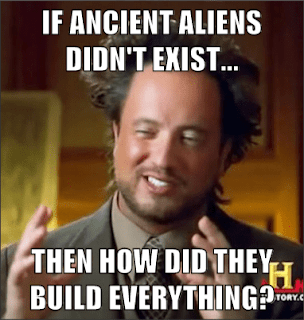 Why should it become evidence for ancient aliens?